I did not really know what title to choose for this image. 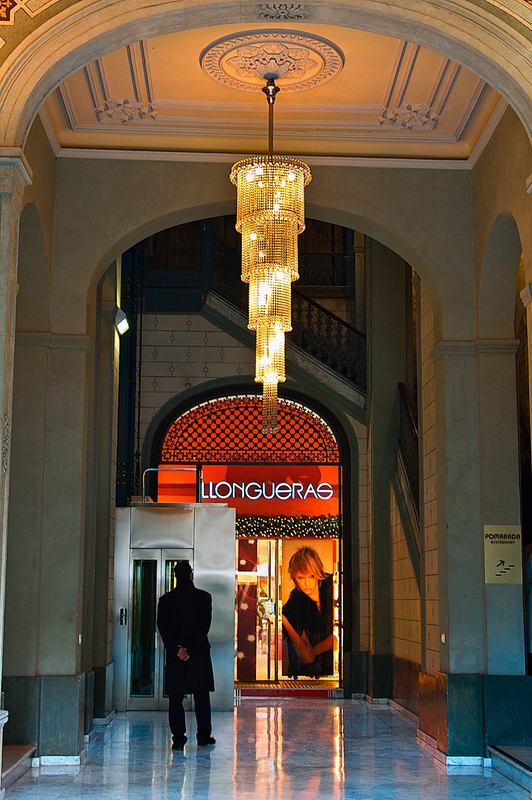 The man facing the woman in the poster, standing under a beautiful ceiling lamp was the first thing I wanted to show but then on second thought I realized that the Llongueras hairdresser in the background, run by a well known coiffeur in the city was better for my SEO. I find this a dilemma nowadays, either you get artistic with your titles, you know, trying to express a concept with one or two words, like say, "Waiting" or you mention the obvious: "Man and Lamp". But then there is the third choice which is the most abject, trying to please search engines to stay on top. Well, I think I managed to squeeze all possible titles in the post, that is the last minute resource. The hairdresser is at Passeig de Gracia, one of the many by the same name spread around Barcelona. I never considered writing titles with SEO in mind but I know something about the subject. I will think about that more. In any event, it's quite a striking image. Someone has probably asked you this before, but do you know why your photos have such bad color when they appear on the portal? Maybe it is my computer. It's a very glamourous photo with the huge, crystal chandelier and the high fashion model poster! - LOL haven't got the slightest idea. I seldom take a look at my pictures on the portal. Most of the time I am busy doing something else. It is good you point that out. Maybe it is a campaign against me (joking here). Now, seriously, when you open my blog, do you still see such bad color? I can check them both in my PC and at work and they look more or less ok. Of course it can be a problem of wrong screen calibration or over saturation in CS5. Could you give more details? Thanks again for your observation Bob. - Leif that is really very kind of you, thanks. Update on my last comment: Well Bob, I checked the picture at the portal. It is located between a green image from Murcia and a very blue sky in Andorra. Apart from the contrast between standing in the middle of two colorful pictures I don't see anything abnormal in the color. He was definitely looking at the woman, I would do the same, if I were him :) Thanks Lydia. Well, titles are important if you want traffic, sometimes it is no trouble finding a good one but most of the time I would prefer a more conceptual choice. I see on the web many photographers that are not worried about SEO, giving wonderful titles to their photographs that really contribute to the meaning, to the idea and the results turns out to be more poetic.